Do Writers Write Every Day? Hey y’all, so I was wondering what everyone thought about writers having to write every day. I talked about it on my youtube channel today, but I wanted to ask all my writers here on my blog. I feel that writing every day isn’t necessary if you have a grasp on your writing style. I think that if you trouble with certain things or don’t have the greatest imagination then you might want to practice writing. I always have ideas coming from everything and I don’t write every day, but I don’t think my writing suffers because of that. I think that if you want to be a writer and don’t know what to write about or what you like then yes, you need to write and you need to find something that you enjoy writing about and you need to find your voice, but for me that’s not the case. I write when I want to and I know my voice, so I focus on novel writing when I feel like writing. I think the main thing is not to stress writing either. If you love writing then it should never feel like stressful, annoying work. I want to talk about Youtube. I have a Youtube channel to make funny videos and post my video book reviews. I’m always going back and forth in my mind on whether as a writer, a reader and an author is there more that I can do with Youtube. I always watch people who have talents in cooking, singing, dancing etc that are more visual than writing and I get envious. People with those talents can quickly share their work on instagram, vine, youtube and more without getting people clicking off. I feel like writing something and reading it via Youtube people may be bored by that. I want to give Youtube writing a try. It won’t be like Instagram writing where people post a chapter of a story with every picture they post. I think I want to talk more about all the ideas that come in my head, writing industry stuff, help promote other writers and more things along those lines. As a self-published author of 14 books and still being very young, I think that I have a lot that I can share as well as learn from everyone out there. I just want to find ways to connect with other writers, authors and readers. Any thoughts? I’d love to hear them. 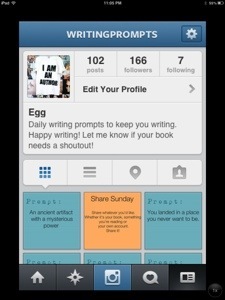 Instagram for writers, but it’s a pretty good one to get you thinking. FOLLOW THE IG: @writingprompts ! I’m a self publisher. 20 years old and I’m working on publishing my tenth book. People argue that self publishing is bad and self publishing doesn’t have the quality that traditional publishers do, but I argue that self publishing is the most traditional way of publishing. Before there were publishing houses writers sat and hand wrote their short stories to share with people and before that people would pay to hear a story told of distant places. People were creating all by themselves. They were finding ways to get their work out and be paid for it. Many people don’t realize that so many of the famous stories we love and look back to were self published first. Whether their stories were first denied by publishers or they self published first, they were self published. I can’t stand people who say all self published books are horrible because it’s very likely that a book you love was once self published. It is traditional to share talents. It is traditional to put your foot out about something you’re passionate about. It is traditional to try to make money doing what you love to do. It is also traditional to take chances. Self publishers put themselves out there and work very hard to promote writings that they believe in. I say taking chances and that makes me laugh because it seems like I’m asking you to read a huge self published novel with a cover that has words misspelled. No, that is not what I’m asking. I’m only asking that you don’t throw all self publishing authors in the same bin. 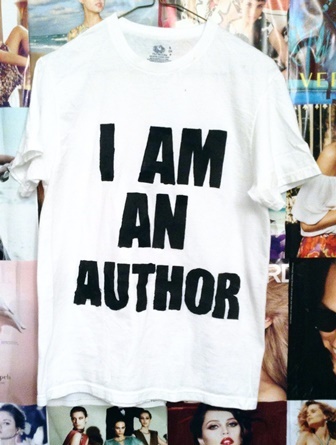 As for self publishing authors, I’m sticking up for us, but you better write the best gosh darn novel! (LOL.) Don’t put out crap. Edit and re-edit. Ask a friend, family member or me to read through what you write. You know what your novel is supposed to say, but someone else reading it only reads what it does say. For self publishing authors giving free ebooks is the best way to gain readers and test your foot in the publishing waters. Self publishing is traditional. Putting your self and your work out there is traditional. It’s ordinary to share your work, but you hope that people find your work more extraordinary than anyone else in your field. So, good luck.